Lately there has been a push towards connecting all our devices wirelessly to the internet. So I have finally replaced my much beloved old Sony portable radio with an internet radio the Grace Digital Mondo GDI-IRC6000. This device is equally a Wi-Fi music player and an internet radio by Grace Digital, a major player in wireless music category. It aims to provide a portable wireless digital streaming solution for numerous internet radio stations and other online music sources. Mondo GDI-IRC6000 has a 3.5" color LCD screen for album art and other information. You can either choose to listen to music over the internet or to broadcast digital audio files through your local area network with Grace Digital Mondo. The Grace Digital Mondo is quite attractive with an outer case made of glossy plastic. There are 3 kinds of back colors available: Black, Red and White. But the front panel has only black available. Grace Digital’s Mondo is a versatile and portable Internet radio that measures 3.5 x 9.75 x 5.75 inches and weights 6 lbs. The left side of the front is covered for hiding the inside speaker. The right half is for a 3.5" color LCD screen and main control buttons. Its screen can display navigation menus, device status, album art and even weather information of your city. Its buttons are located around the screen. There are 2 knobs the one below the screen handles the job of menus scrolling and selection. The other one on the top edge is for volumel. Next to the volume button is the snooze button. So it can also act as a clock alarm radio, makes it a better choice for the bedroom. The headphone jack is on the right side of the body. 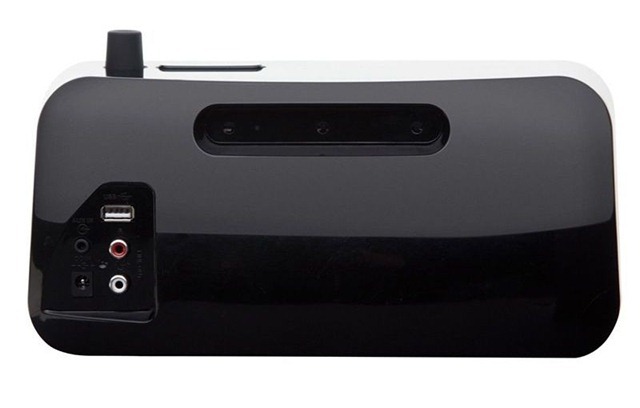 USB input slot, RCA stereo output and 3.5mm audio in jack are on the back. Unlike its competitor Logitech UE radio featuring both wired and Wi-Fi connections, Grace Digital Mondo requires a Wi-Fi network to perform all its mission. Mondo’s network setting is very easy. Turn on your Grace Digital Mondo it will display all available wireless networks on the screen. Using the knob to scroll and confirm your network then enters the security key if necessary. In this step, you will see another heartwarming feature by Grace Digital. They manage to show all characters including capitalized ones and specials on one screen view to facilitate your putting. You don’t have to switch to another page to find other letters like done with other devices. It will also help when you config some subscription service like SiriusXM through the remote. After that your wifi music receiver will connect to the internet. 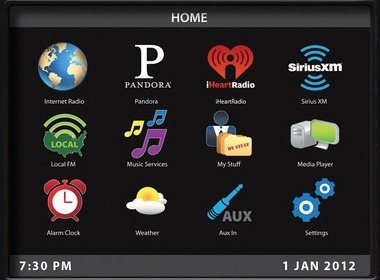 The Home screen is well laid out and all the options for the radio are easily to be set using the front knob. Once you get a successful connection you can get a seven digit alphanumeric key in the register item under setting menu. Use that key to create your Grace digital audio account in this website http://Grace.Reciva.com. 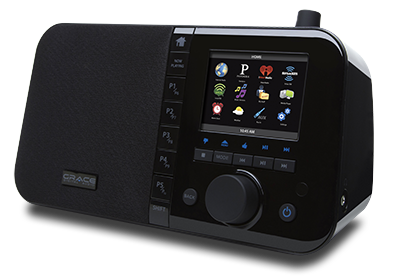 Using the Grace account, you can integrate Pandora or other subscribed account into any Grace Digital Audio powered device. It will take your listening pleasure to a whole new level by enabling some interactive features. Grace Digital has 5 physical preset buttons arranged in a vertical line beside the screen on the panel, and with shift key function that number has been extended to 10 presets in total. Presetting is valuable for traditional radio lovers like me, because we are customary with that kind of ability with short wave or FM/AM radios. It gives you direct access to the station you prefer. 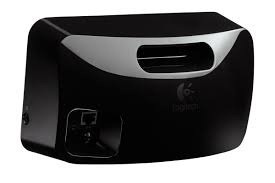 It is comfortable and easy to program favorite stations to presets on GDI-IRC6000 wireless music player. 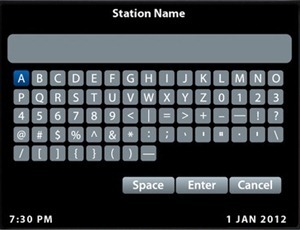 Switch to the station press one preset button and hold on, do not release until you get the confirmation message saying that is done. Like other features of Grace Digital Mondo, these presetting can be done with your iPhone or android phones. It will just take a couple minutes to fill up all ten options with a combination of traditional radio stations, podcasts, and Pandora stations. Very Convenient Design! Another noteworthy feature of the Mondo is the local radio station setting. Based on your ip address Grace Digital can give you a list of local radio stations who simulcast their signals on the internet. So you have the freedom to listen to most of the stations in your area without the hassle of worrying about antenna reception strength. If your favorite internet station is not part of your selection list, you can even inform the Grace Digital to have that station enrolled into their database. So station preferences on the Mondo are seamless. 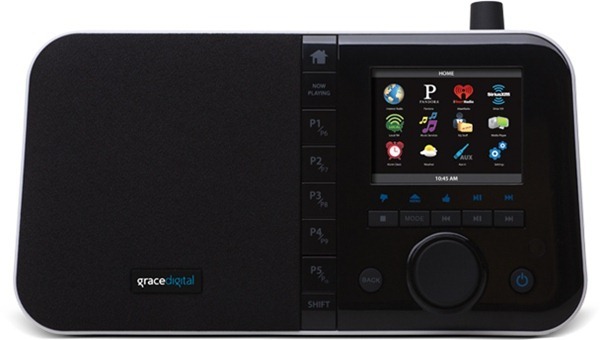 Grace Digital Mondo come with a full-function remote control, with it you are capable of adjusting most functions on this Wi-Fi music player. But the most popular and convenient way for controlling this GDI-IRC6000 today is through apps on smartphones. Viewing information and adjusting setting from a larger touch screen is much better than performing the same mission through a plain plastic remote. You can control every feature of the Mondo from any iOS or android device through Grace’s app. Once you get familiar with app, you don’t even need to touch or look at the Mondo to let it function well. The Grace Digital Mondo will find recognizable music library on your own intranet automatically. You can select and play high quality albums or genres. According to other customers, Mondo may have a problem with certain single folders holding too many music files. I haven’t experienced that with my fairly organized music lib. There are currently over 150,000 Internet stations for Grace Digital Mondo with all genres, some I never know existed. And the number is still growing with the time pass on. Subscription services like Pandora, iHeartRadio, SiriusXM, Rhapsody are all supported. 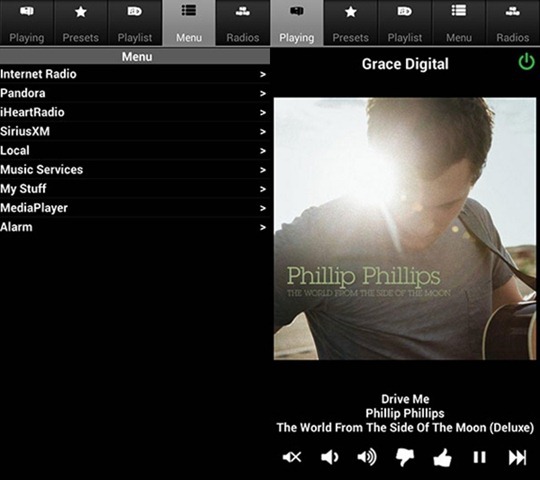 NOAA (weather), Live365, DAR.fm and NPR Service are available for Grace digital internet radio as well. You can select one of these with the front panel knob. For each genre, there are a multitude of stations that can be scanned by name or location. If you are about to find a specific genre just scroll through the main homepage to sub pages step by step. And of course the most convenient way for this is through Grace app just like other setting. For streaming local music this wifi music player supports nearly all audio formats from compressed MP3 to 24-bit 96kHz FLAC. All the following types are compatible: AAC, AAC+, MP3, OGG, WAV, WMA, Apple Lossless and FLAC. Music sounds pretty good at normal volumes in a kitchen or bedroom. The audio quality is solid for such a small unit. But it’s not designed to satisfy a dedicated audiophile, I would not choose best to describe its sound comes from the 3" woofer and 1" tweeter with a 12W Class D amplifier. And low streaming rate of most internet stations will also be responsible for this quality issue. Because switching to Pandora or Rhapsody, which streams with a higher bitrate,will improve performance with a noticeable change. Most of our daily listening through a radio is either talk radio or songs tracking while you do other things. 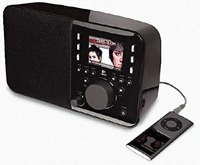 Sound quality is the not the only concern you will have when choose an internet radio. In addition, RCA jacks at the back of the unit will allow a connection to external speakers, which can improve audio substantially. The Mondo is capable of really fine quality audio, just not through its own internal speaker. Mondo has RCA for direct connection to an audio system, USB port gives the user options to play music stored on FLASH driver or adding an optional Ethernet adapter mentioned above. 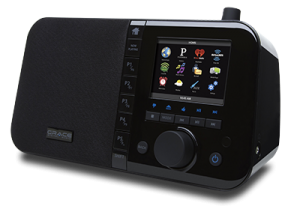 The Grace Digital Mondo surpasses the Squeezebox Radio in some areas, falls short in others. Mondo is now the best sealer in Amazon.com. Logitech quit the wifi radio field. So Mondo is a better Wi-Fi music player than Logitech’s Squeezebox Radio. Direction buttons config is confusing on its infrared remote: Down for left, Up for right, Right for mute and Left for back. The Mondo really makes listening to Internet radio as easy and enjoyable as possible. It gives you access to just about any form of digital audio source you can get your hands on. 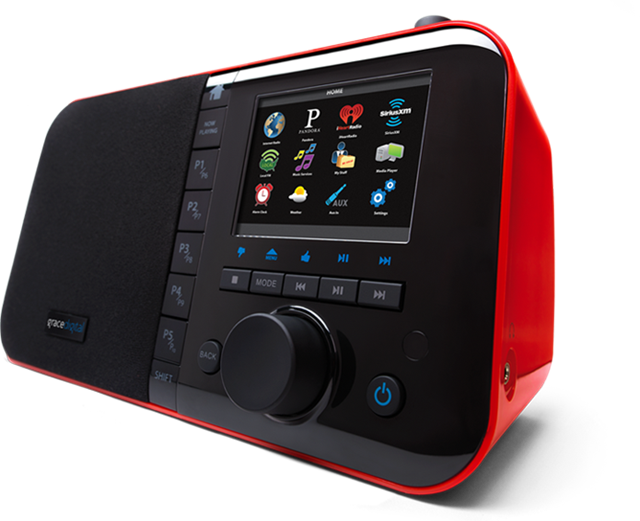 Grace Digital Mondo brings convenience like full app control, weather forecast, RCA audio out and wifi music playing to radio fans. All these add up to make this one a better choice when you want to built your personal music system. Especially best for medium sized environment. Gracedigital is no longer in production. A dateline on this article might be helpful so people don’t waste their time with it.